Listening Library, 2012. 6 hours, 46 minutes on 6 compact discs. I love this series. It’s written for children and at a child’s reading level, but there is plenty for the adult reader to enjoy and that children will enjoy along the way. 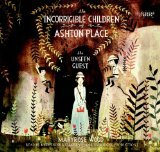 The main character isn’t so much the Incorrigible children of Ashton Place, three children raised by wolves, as it is their governess, fifteen-year-old Penelope Lumley. I only started the series a couple weeks ago, and I didn’t hesitate a bit after finishing Book Two to start in on Book Three. I was wondering if Book Three would tie up all the dark hints we’ve been getting in the previous books. Well, it doesn’t. In fact, we get all sorts of new questions and new hints of deep dark connections. In this book, the series switches from a possible trilogy to an ongoing Saga, with more wild adventures at each step. Now, you can tell by simply reading the first book if you will enjoy the series. If you will enjoy the series as much as I do, you will be quite pleased that Maryrose Wood is not stopping with three installments. The wild nature of the new adventures (Hunting an ostrich! Riding on wolves!) juxtaposed against the prim and proper Victorian society, far from making the stories so unlikely you don’t want to read further, is exactly what makes them so much fun you enjoy every moment. Penelope is gaining a little wisdom along the way, but her naivete, her sweet admiration of her “friend,” Simon Harley-Dickinson, her pride in being a Swanbourne girl, and her earnest efforts to educate her pupils are all so endearing, you simply can’t help but like her. The narrator’s tendency to go off on a tangent and to define certain expressions and then use them again and again, far from being boring, tedious, dull, and uninteresting, will have you laughing with delight. I recommend starting this series at the beginning. That will tell you if you like it enough to want to go on. Yes, it does get a bit more wild as it goes, but if you like the beginning, you will enjoy the continuation. This entry was posted on Wednesday, June 12th, 2013 at 11:13 pm and is filed under Children's Fiction Review, Fantasy, Historical, Starred Review. You can follow any responses to this entry through the RSS 2.0 feed. You can leave a response, or trackback from your own site.